Nobel prize winning economist Friedrich Hayek’s book The Road to Serfdom is required reading for any serious student of liberty. Hayek’s warnings are very timely, as they seem to describe quite well the events we are currently seeing in the American political system. 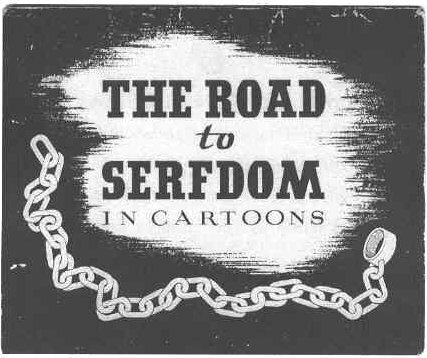 The folks at Mises.org have placed a copy of The Road to Serfdom – In Cartoons on their web site. This effort makes The Road to Serfdom approachable to audiences of all ages and intellectual background. The Road to Serfdom is a chilling guide to the descent of a free nation into a totalitarian socialist dictatorship. If enough free men and women read this great work we may be able to prevent this fall in our time. Please, send this cartoon to your friends and family. It will educate them on the great dangers we face and may interest them enough to read the entire book. This site has supported me a lot to gain awareness in every way about my recent task! Now I have the best idea to how to deal problems! Thanks to them! Got the bestplatformwhile being at home which I was looking for almost a decade and believe me I am not disappointed a bit! Great opportunity here! Five Stars!